In any business transaction, it is important to have a written document that presents all the details that have been agreed upon by both parties involved. 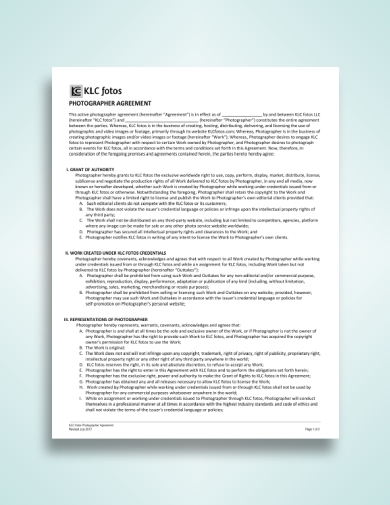 An agreement template is a legally binding document that outlines the terms and conditions both parties have to provide in exchange for the agreed upon products and/or services. 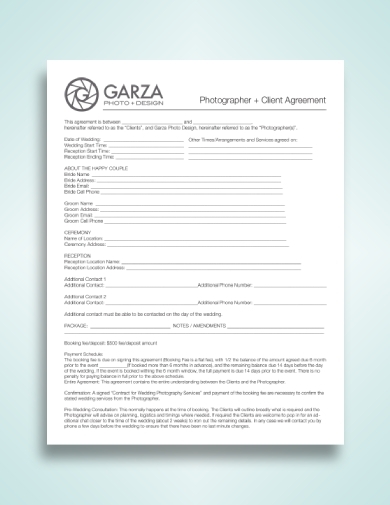 As a photography business, it is important to have a photography agreement to make sure that the hiring party can be held accountable for the obligations they agreed to provide and vice versa. As a business offering photography services to clients, having a fillable agreement that is immediately ready for use is essential. It allows an efficient and more effective way of closing business transactions. 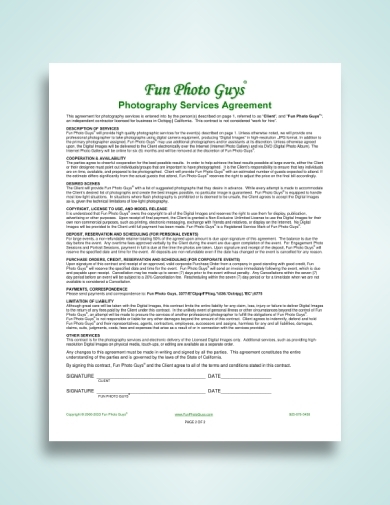 Your photographer services agreement should account for all the necessary details for the booking such as the name of the client, date, time, location, price, and so on. You can download this example to use as your guide and basis when you make one for your own. As much as you want to keep brief, the agreement you should use when transacting a business deal with a client should be informative and complete. Thus, it is best to provide as much necessary information as possible to avoid confusion on both ends. For every section of the photographer/videographer agreement, you can provide a brief explanation as to what it entails for both parties. 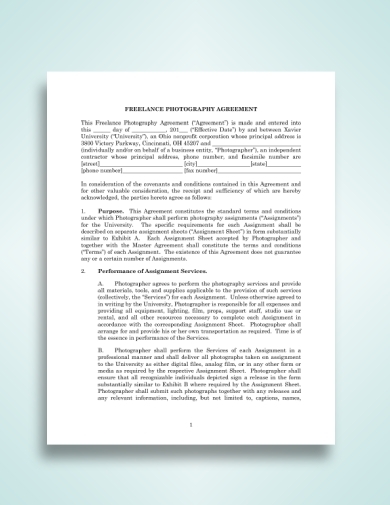 Similar to the previous example, the photographer agreement you use for your business should be detailed and complete. 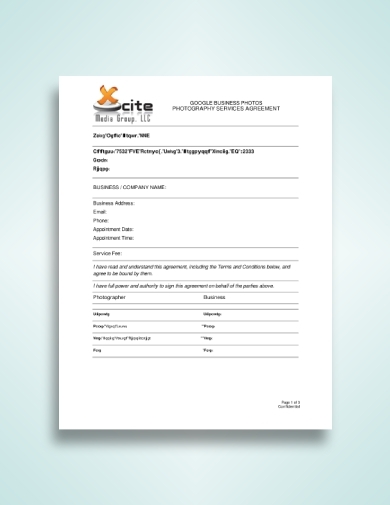 You can break down the specifics for each section of the document to establish a clear understanding with the client. However, it is still important to note that the business agreement should be easily understandable to the client so that miscommunication can be avoided. The photography/videography service agreement that you provide to your clients should specifically state the services you will be providing to them along with the limitations. It should be made clear that you are only to provide the specific service the client has agreed to pay. Doing so will help you and your employees avoid the hassle of being told to do other tasks and services not stated in the agreement. As a freelance photographer, it is hard to find clients that will take you seriously. People often think that you offer your services for a cheaper fee since you are not affiliated with any business organizations. But you can avoid that if you explicitly put those details in your photography license agreement. Make sure to provide all the essential details relevant to the transaction in the agreement to set a clear understanding with the client. If you are hired by a client to provide event photography services to the event he or she will be hosting, it is best to have the terms and conditions you both have agreed upon on paper. 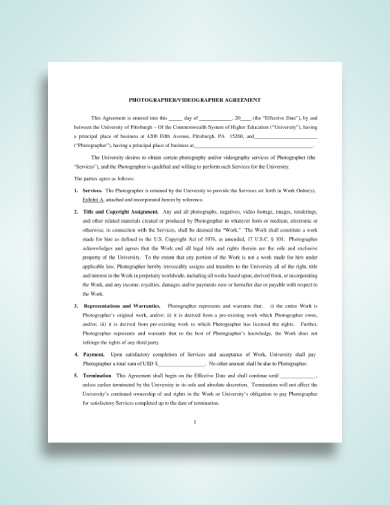 Similar to a photography contract, your event photography services agreement that presents the details about the transaction clearly and comprehensively. It should present information about the event, the fee for the services, inclusions, and exclusions of the deal, and so on. It is common nowadays for the to-be-wed couple to hire a photographer to capture images before, during, and after the event. 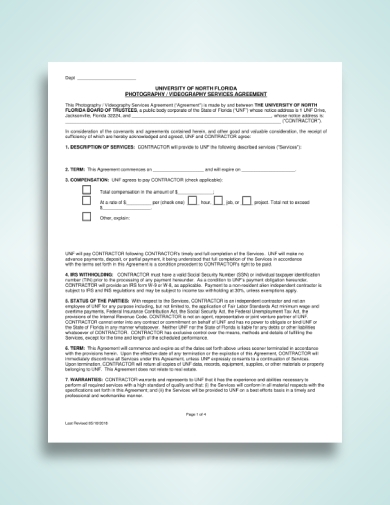 If you are a wedding photographer, you should use a wedding photography agreement similar to this example. The agreement you use should be well-organized and structured to make it look more professional and to help the client easily understand its premises. Renting out a photo booth adds a fun and interesting gimmick to your event or party. If you are a business establishment that offers photo booths for events and parties, you need to have a rental agreement that outlines the terms and agreement both parties have to adhere to. Furthermore, other details such as guidelines on how to use the photo booth, how many filmstrips to provide for each user, etc. should also be included. In order for a business transaction to become successful, a clear understanding and a positive, professional relationship should be established between the product or service provided and the client. That’s why having an agreement between a photographer and the client relevant to the transaction is important. More than the business and financial aspect it provides, it helps to keep a harmonious and favorable relationship between both parties. A school or an academic institution will need the services of a photographer when it comes to taking student and faculty IDs, yearbook photos, and so on. This means that they will hire a third-party business to provide for that need. 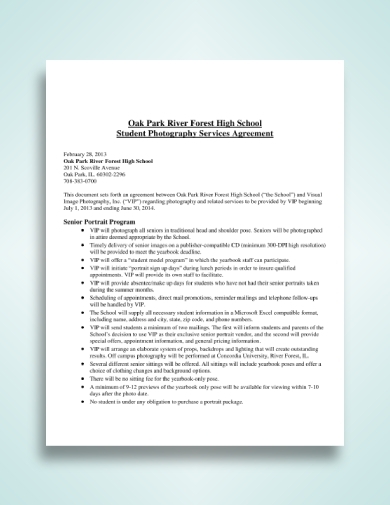 Although the photographer can provide for the official agreement, the school will most likely do so, as seen in this example. Remember to communicate your end of the bargain clearly so that it can be included in the agreement. As much as you want to rely on the actual facilities and appearance of a real estate, using a well-captured and high-quality image in your marketing materials will surely help you effectively promote the property. With that said, hiring a professional photographer is ideal in this situation. 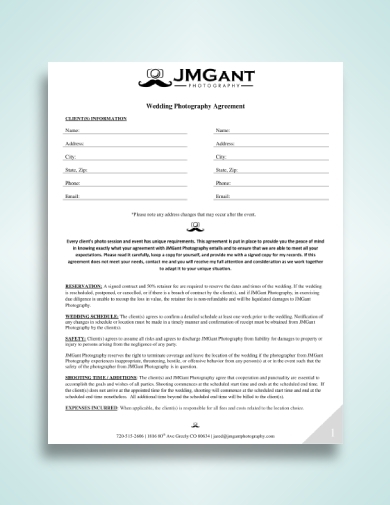 The photographer will have you sign an agreement similar to this example that will provide all the necessary provisions to help make the business transaction successful. 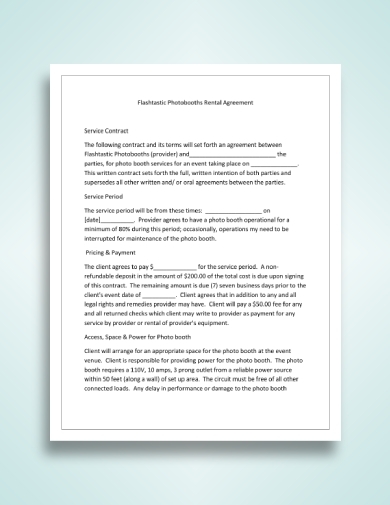 Although outlining, drafting, and publishing an agreement for your photography business and needs can be quite challenging, it’ll surely help in ensuring that the transactions you get involved in are all successful and profitable. 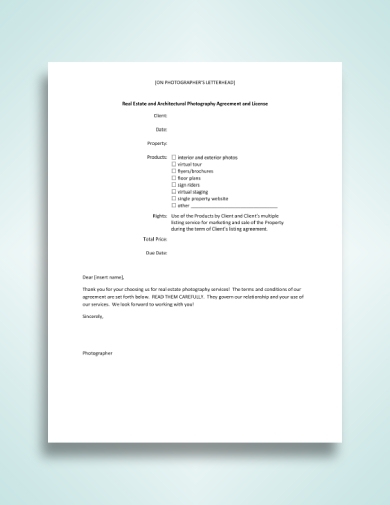 We hope the photography agreements we have provided has been useful for you. You can download all the examples to use your guide.